By The Politico's Ben Smith. As Sen. Barack Obama, D-Ill. defends himself against anti-war critics this week, his rivals are taking the opportunity to cast themselves as more firmly opposed to President Bush's Iraq policy than Obama – who happens to be the only leading Democratic candidate who publicly opposed the war when it began. Obama has found himself facing a storm on leading liberal blogs over a weekend interview in which he spoke as though he were an observer, not a participant, in the confrontation between Congress and Bush over a threatened veto of legislation that sets a deadline for withdrawing U.S. troops from Iraq. "I think that nobody wants to play chicken with our troops on the ground," he told the Associated Press, adding: "I don't think we can muster at this point a majority of Senate Democrats or Republicans to vote for a cutoff of funding." Sen. Hillary Rodham Clinton, D-N.Y., in contrast to Obama, has refused to take Bush's veto for granted. She launched a petition drive Monday to demand that Bush sign the bill. Asked in Crawfordsville Tuesday whether Obama's willingness to look past the veto was helpful or unhelpful to the Democratic position, she responded: "I'm only going to speak for myself, and my position is we have to negotiate with the president from a position of strength. "We need to change the approach of the White House, which means you've got to stand firm and say, 'We don't expect you to veto something that represents the will of the American people,'" Clinton said. On a two-day swing through eastern Iowa this week, Clinton has put the idea of a confrontation with Bush on Iraq – and the implicit distinction between her and Obama – at the heart of her stump speech. One local Democratic Party official told The Politico that a Clinton aide had also suggested that he and other audience members ask questions about the confrontation. Clinton's focus on the issue reflects her campaign's preoccupation – expressed openly by her husband in conversations with donors – with presenting a muddier and more nuanced view of the politics of Iraq than the narrative embraced by some political observers, which casts Obama as an opponent of the war and Clinton as a supporter. Former North Carolina senator John Edwards has also sought to define the confrontation with Bush more sharply in the wake of Obama's comments. "Now is not a time to back down; it is a time for strength and conviction," Edwards said in a statement Tuesday. 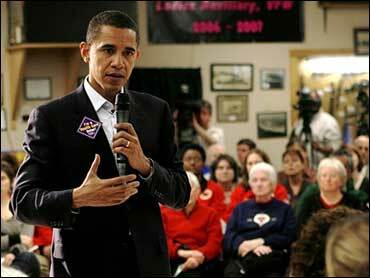 Obama's opposition to the Iraq war in 2003 is unquestioned. But what was a sharp anti-war line on the campaign trail in 2004 – when he said he favored voting against funding the war – turned into a more pragmatic Senate performance, where Obama has taken a less aggressively anti-war tack than fellow Democratic Sens. John F. Kerry of Massachusetts, Russ Feingold of Wisconsin and others. As a review of their votes by the website TPMCafe showed last week, Clinton and Obama have almost identical voting records on Iraq in the Senate; they cast different votes just once, when Obama voted to confirm Gen. George Casey as the Army chief of staff and Clinton voted against his confirmation. Obama's choice of pragmatism over confrontation has long frustrated some anti-war figures, and their sentiment boiled over after Obama's comments to an Associated Press reporter in Iowa last weekend. "Obama just surrendered to Bush," wrote Daily Kos founder Markos Moulitsas Zuniga. Faced with complaints from Obama supporters, he asked them to "imagine if this was Hillary saying these things. You'd be demanding her head on a pike, and so would I." Obama's spokesman, Bill Burton, declined to comment on Clinton's new tack, and it remains unclear whether the nuances of the present Iraq debate can displace a fact of which Obama frequently reminds his audiences: that he campaigned against a war his rivals voted to authorize. And even as Clinton pressed to exploit what could be a momentary advantage, the playing field shifted again, as Senate Majority Leader Harry Reid signed on to Feingold's threat to cut off funding for the war after March 31, 2008. Pressed by reporters about the Feingold legislation, Clinton said she hadn't yet read it.